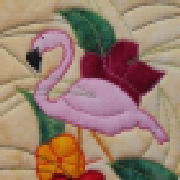 Welcome to the Shop of Patchwork Flamingo Quilt Designs. Sometimes in our hectic, stress filled lives we all need a little love and comfort. For me, designing and creating quilted treasures provides that love and comfort that I can then pass on the someone else. I believe that the love and comfort that I sew into every quilt is passed on to the person who uses it. Quilts envelope you in love. They comfort you. They provide hugs. All my items are machine washable on the gentle cycle in cold water. They can then be hung to dry or dried in a dryer on the lowest heat setting.